Uglyworld #5 - Sharing Irn-Bru With The Guys, originally uploaded by www.bazpics.com. 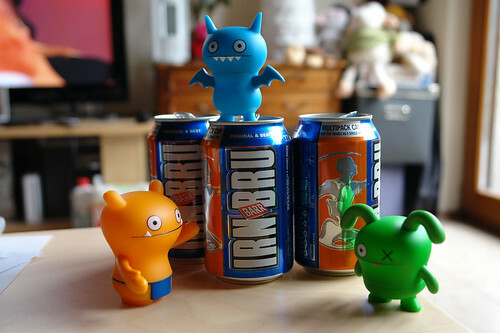 Here's Wage, Ice-Bat and Ox with their stack of 3 irn-bru cans that they slugged down in about 4 milliseconds of opening them on the couch earlier while watching Formula 1. Ice-Bat has a neat trick where he stands up on top of the ring pull and then takes off, this opening the can - he declared it as his party trick and has supposedly filed a large lump of paperwork in order to trademark it too.